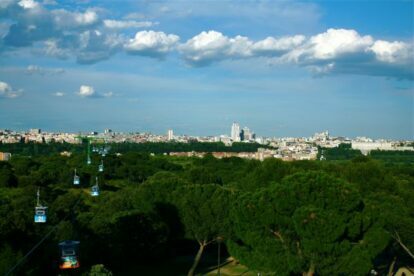 The teleferico is a simple must when you visit Madrid. It’s incredibly cheap and the ride from parque del oeste to casa de campo takes just a mere 15 minutes, and we can all take a pause from rushing and enjoy some amazing views for that timespan. Something that is hard to come by in big cities are the best views. So once you step off the teleferico don’t just go running into the green fields that are Casa de Campo, take your time to go onto the lookout deck of the cafeteria in the same building you arrive.